Theophony wrote: Don’t they have magic duct tape to fix wands? Made by magic ducks . Anvildude wrote: Nah, they just patch it up with some spell-o-tape. monkeytroll wrote: Is that a type of tricky backed plastic? First and foremost, cleanup on these was a breeze. The combination of new material and new casting process is leading to exceptional quality with minimal prep required. Builds are very easy, no gapping really (tiny bit on the unicorn's spine, but that's it). 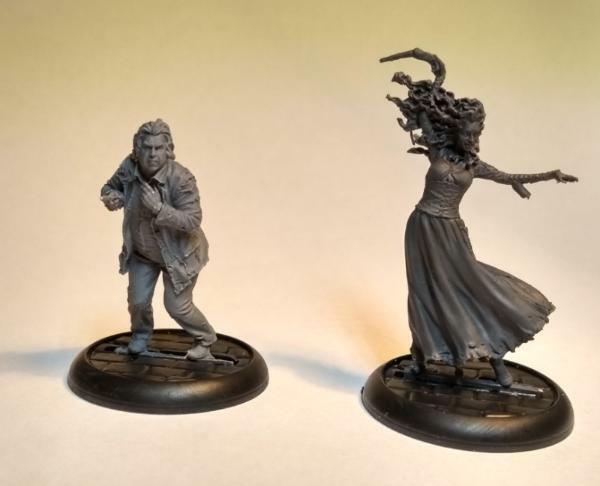 On to the models! Apologies, I've not yet done the Order of the Phoenix, the Weasley twins or Dumbledore's army. 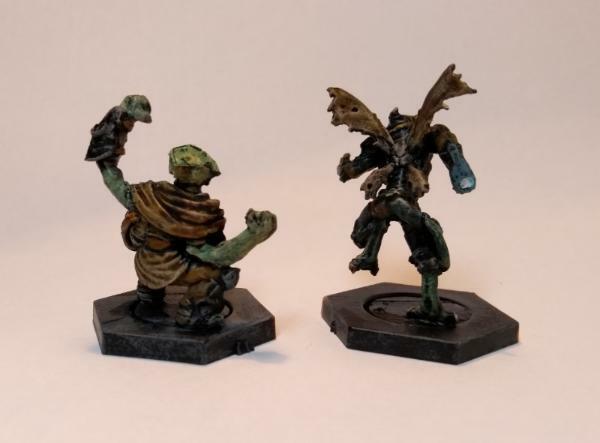 Stunning sculpts. Just amazing. 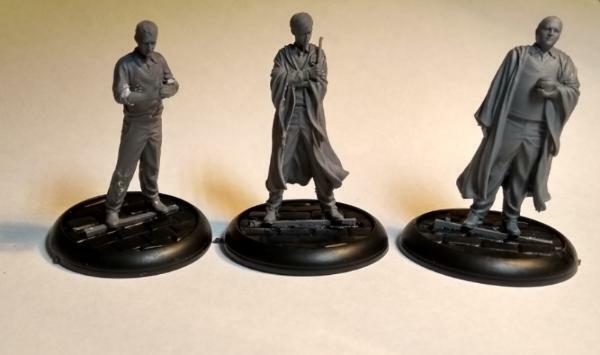 Now at this point, I reckon £35 for 4 character models is fair. 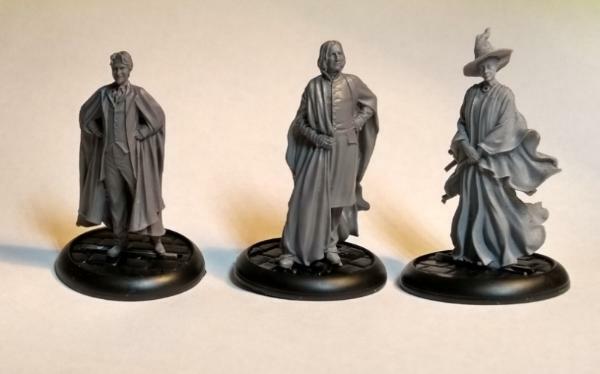 They all terrifyingly good, and versatile, in game: Snape is of course Potion supremo plus dual faction Hogwarts/Death Eater, Umbridge a Death Eater, Lockhart is Hogwarts with access to Dark magic, and McGonnigal is just a very very powerful (Power 3) light wizard, although doesn't have Animagus, which is annoying (neither does Peter Pettigrew, which is idiotic). Peter is perfect, Bellatrix... doesn't look like her. 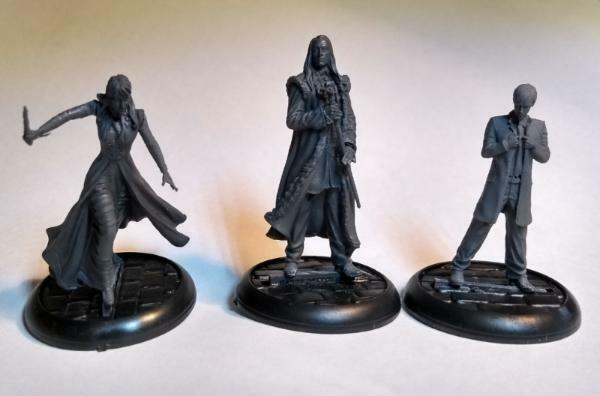 It's a decent version of the BOOK character but given that part of the USP is that these are as much collectors' pieces as gaming pieces, I think they've missed the mark. Both are pretty nasty in game, with Unforgivable Curses as their innate spells. 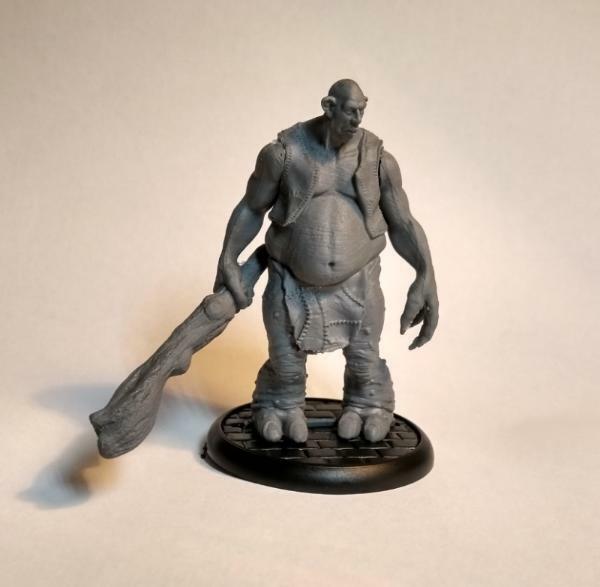 Lovely models, and proper value for money on this one. This is a good example of KM doing it right with multiple cards, including a version of the werewolf for the event deck also. Great version of him. I love that in game his umbrella gives him the ability to cast spells as normal. Fang's pretty decent too, very cheap for extra damage output. 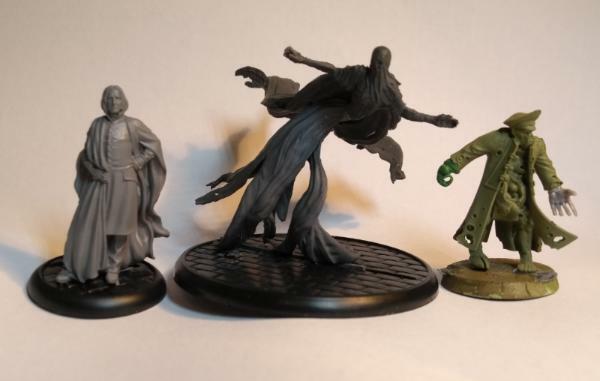 The Lucius is a particularly impressive sculpt. Narcissa is very good in game, and a lovely pose, but I fear fragility. This Draco is a Death Eater, and not bad at all; good to have a proper second version (looking at you, Lion Hat Luna). Draco and Goyle are spot on, Crabbe not quite. They're good in game, dual faction Hogwarts/ Death Eater - and absolutely should've been in the basic game. Essentially mirroring the Potter crew, this would be far more logical for both standard and co-op play. Nice enough model I suppose. 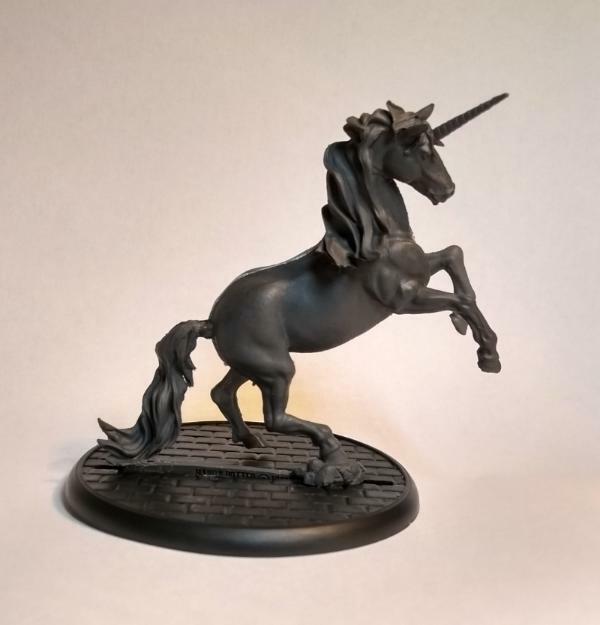 But it's just a generic unicorn, albeit big (60mm base). 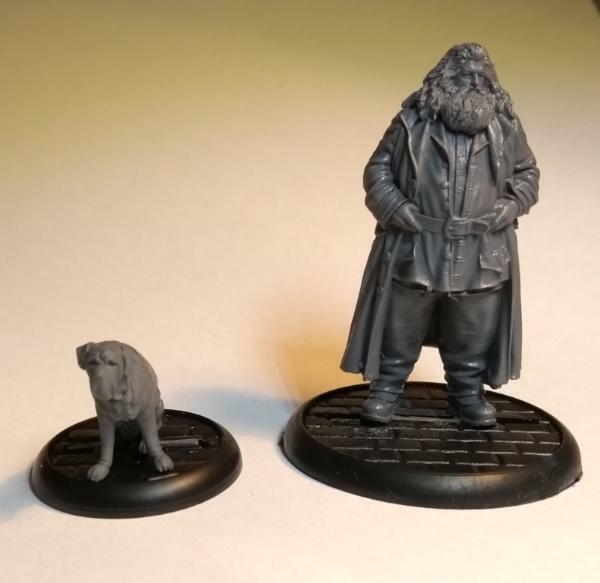 Same height as Hagrid. Not bad, very movie accurate. 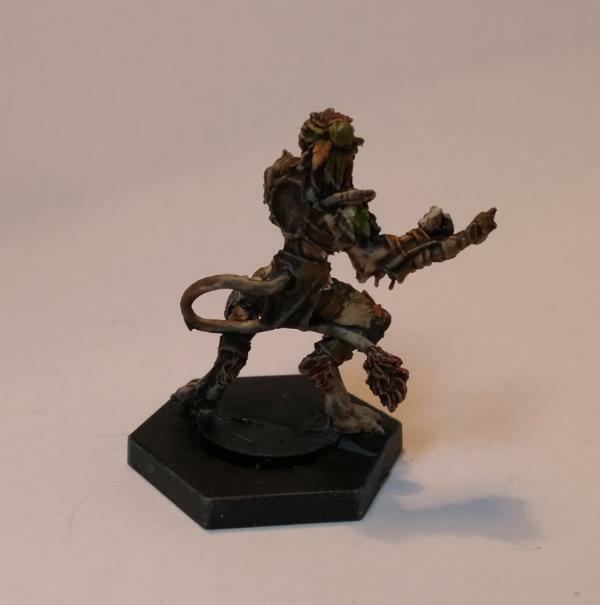 Oh, yeah, made a Commissar poxwalker, just cos. I honestly don't feel that the Adventure packs offer much value. £35 each for one fig, a scenario card, and a couple of other cards (for the event deck and detailing stats). Now if they'd come with, oh, I don't know, cards for the ADVENTURE deck say, I'd be more sold. 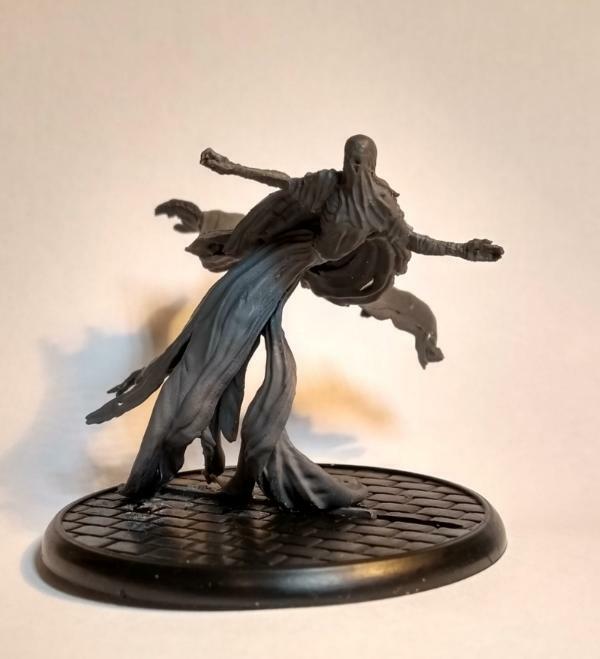 The Dementor is a cracking sculpt, and genuinely interesting in game, so it's probably the best bet of the 3. 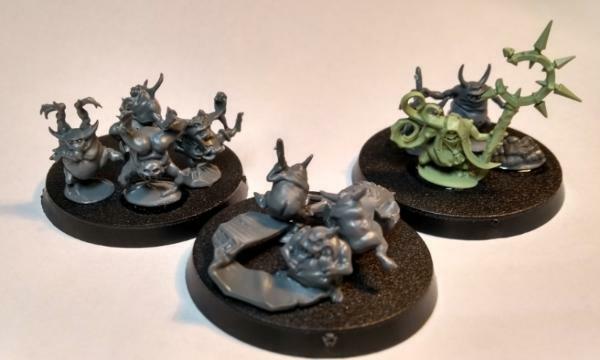 I've also been assembling some bases of Nurglings, because they're just comedy gold. And whilst tidying (well, sort of), found this guy. He is, I think, a classic fantasy lich that had a club maybe? 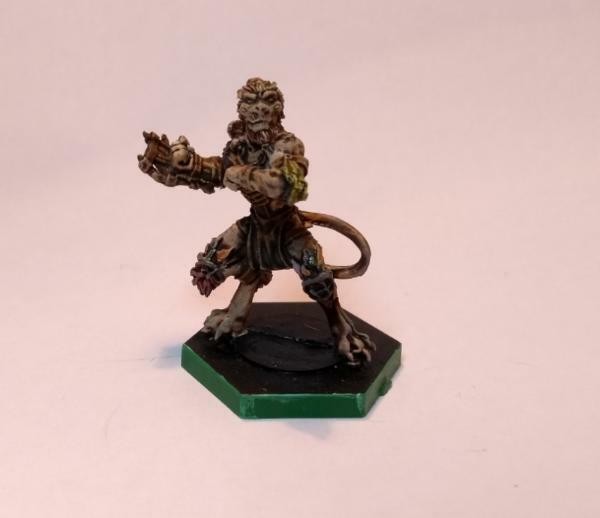 I painted him 30 years ago, or thereabouts. I think he deserves a new lease of life in service to Papa, so a new weapon beckons, amongst other things he's now got a Scion backpack, just for looks. Away at my folks' for a few days. Going to try some Wings of Glory and Gaslands with my boys if possible. 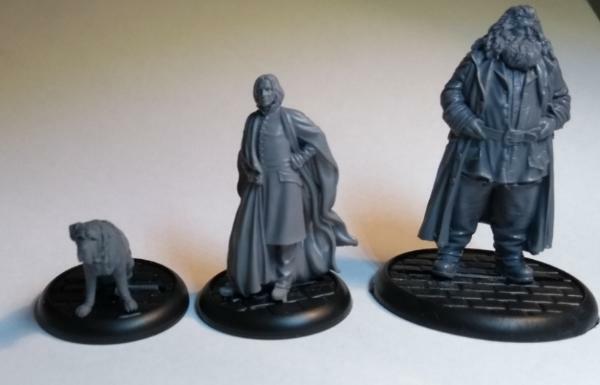 The HP figs DO look really nice , maybe I can get my wife into.......nope she wouldn’t be enticed as its a game . I imagined the poor unicorn with a gap in it’s spine being in one of the dog wheel chair things . Squeeking around the woods. My cousins have dachshunds and they wind up with that crippling back injury all the time and they have one in a wheelchair . Enjoy the Carnage . You need to rock some monster jams music while you guys play . Hello all, and a happy 2019 I hope, to you all. I'm trying to convince my wife also. No luck so far. We've been away over New Year at my parents' with limited signal, so hence the silent running. 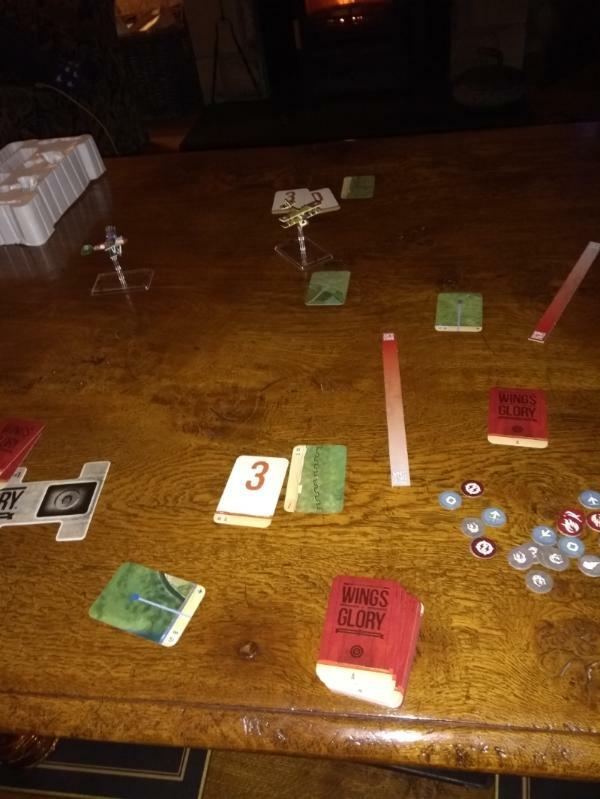 We've also played Wings of Glory. Well what a wee cracker of a game that is! WWI version, Albatross vs. Spad XIII. Easy, Intuitive and really quick to learn/play. But bit of a bugger to get stuff for it turns out. We've played a few Dogfights (very evenly matched), a mission to take photos of an enemy position (bit dull), and a mission to bomb an enemy position on the trenchline (excellent mission). I do like a game with properly done prepaints, if nothing else. 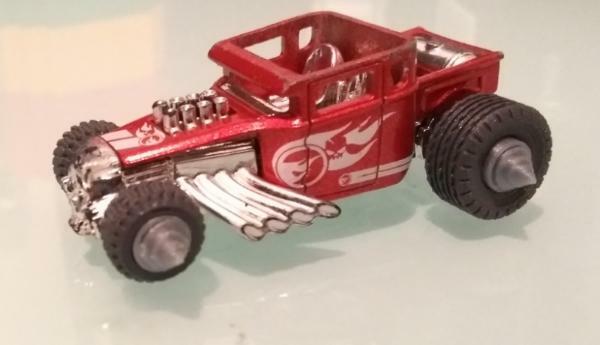 Tried Gaslands. Bit more complex than Wings. Again, both boys loved it, though the older boy felt it was a wee bit crunchy out of the gate, whilst the younger loved it unconditionally straight away. I'm pretty sold on it too. Free gaming (well ok £10 rules) rocks. Immediately after this my kids conspired to Wreck me (Red). I'll delve deeper into the rules but I love the conversion potential here. 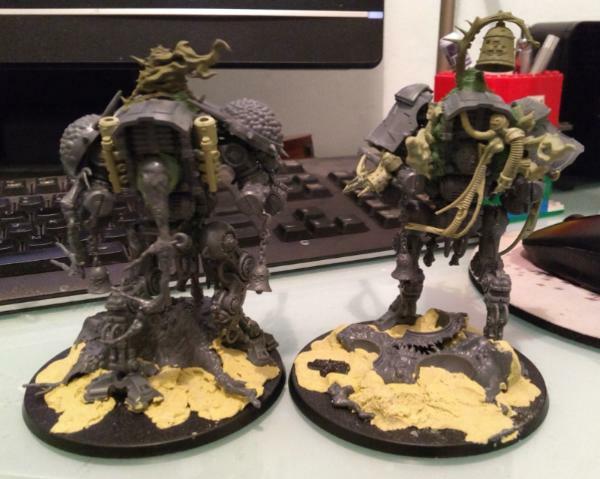 1) Built, painted and completed a 40k army which my friends clubbed together for 40th birthday, in the space of 6 months. That's got be a first. I'll try to get an army shot done in the next couple of days. 2) Got into new weathering techniques, partly as a result of the above. Learned about powders and played with salt weathering. 3) Started getting my kids into 40k. Probably unwise but there we are. 4) Painted a lot in terms of quantity, but less so in quality. A big part of this year has been getting Dreadball teams on the pitch, and so I've not been so focused on the higher quality for, say, Batman. So hobby goals for 2019 then. Daemons etc for Nurgle. I've got Mortarion, maulerfiend, plaguebearers and chums, cultists and a couple of bits to do. That's a bit grim but I'm generally not going to let my shelf of shame bother me. I've been asked to be a mod of the main BMG group. Apparently I know what I'm talking about. Likewise I have the Harry Potter stuff to do. I'm a bit torn on this because I have had no less than 4 (4!) serious painters offer to do them for me. I'm tempted, but unsure. Against my principles! but I have so so much plastic crack to do. Which is next resolution. Some actual gaming. Part of the reason for enlisting the children has been to this end, but I definitely want to do more gaming in my own house with my mates this year. I don't really mind what we play, but anything is better than nothing. Everyone is sold on Dreadball, so that's to be encouraged. And. Hobby is how I stay sane, in an increasingly hostile work environment. Subject: Graven's Shelf of Shame Jan 1st - 2018 in review, and new year high jinks! 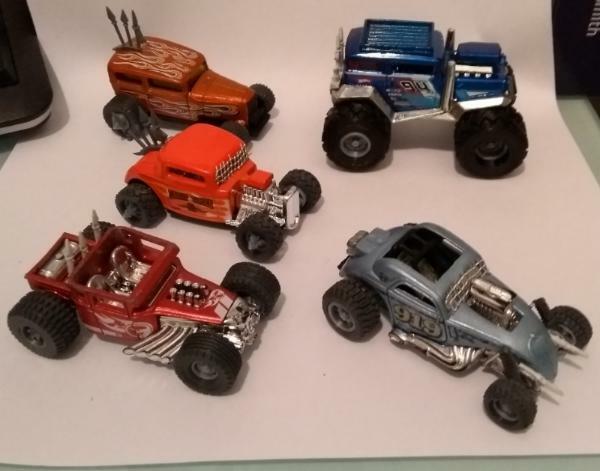 Very much looking forward to seeing HP minis and Gaslands develop. Subject: Re:Graven's Shelf of Shame Jan 1st - 2018 in review, and new year high jinks! One of my local game stores may have Wings of Glory stuff, would you like me to look? Happy new year and cannot wait to see your demons! Check out my P&M Blog! youwashock wrote: Very much looking forward to seeing HP minis and Gaslands develop. Briancj wrote: One of my local game stores may have Wings of Glory stuff, would you like me to look? Och that's really kind of you Bri but reprints start shipping in march afaik so I can probably wait. Thanks for the thought amigo. Zid wrote: Happy new year and cannot wait to see your demons! I have to build my Armigers as well, for which I blame you and your awesome blog entirely! Not sure how to do their faces yet, I suspect one will get a Beast of Nurgle face but not sure about the other. And a happy new year to you too! Armigers are the business, i need to take mine out for a stroll soon... haha. 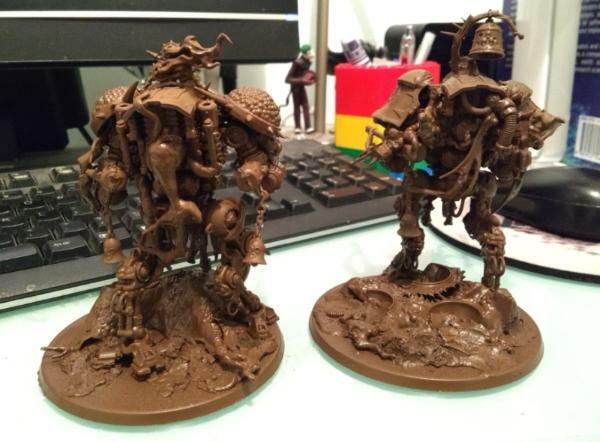 The beast of nurgle idea sounds great, cant wait to see what you come up with! First and foremost, stages of this kit are almost as annoying as building a chimera but never mind. 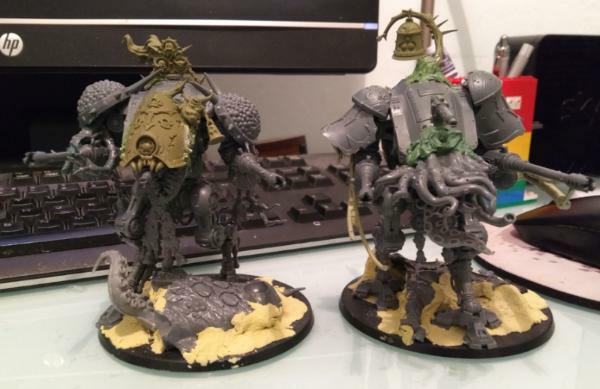 I left off all the leg and arm/shoulder armour, as well as some power doodads and the exhausts as I wanted to modify them heavily, obviously, with the remnants of my bloat drone and the whole of a feculant gnarlmaw. Obviously more gs work to be done, but you get the gist just now? Gearing up for work again can't really complain, it's been a decent break. Not got as much done as I like but, then, when do you ever? 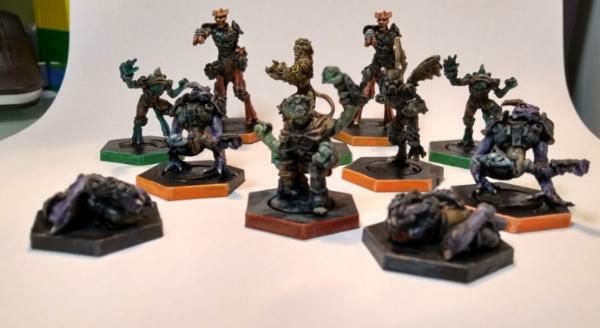 Got a dreadball team I want to get painted up, the Rebs, a hodgepodge alien team that are a bit of a nightmare to play. But hey, they have space frogs. Well if we get space frogs then we will forgive the lack of using the beasts face......not really, but it sounded nice. Gnarly looking armigers, need to get back to mine sometime. Gnarlmaw pads are a nice idea. Hope it wasn't too painful removing the base from that tentacle, not attempted it yet. Theophony wrote: Well if we get space frogs then we will forgive the lack of using the beasts face......not really, but it sounded nice. I did actually try it but it looked rubbish. monkeytroll wrote: Gnarly looking armigers, need to get back to mine sometime. Gnarlmaw pads are a nice idea. Not at all, dead easy. Any suggestions for what else to do to them gratefully received btw. Nurglings, when in doubt add more nurglings . Looking forward to another year with you Graven. Keep up the fine work. Theophony wrote: Nurglings, when in doubt add more nurglings . I would do but they've almost all been appropriated to make the swarms. 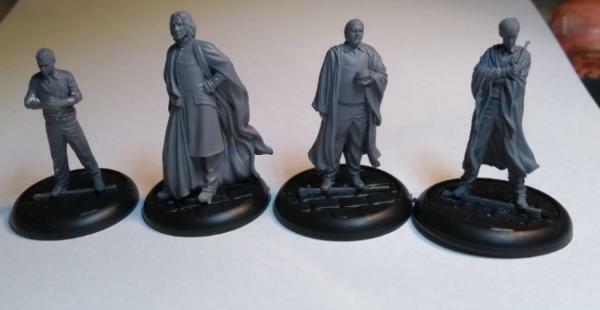 I've picked up a couple of sets of Lord Felthius from Conquest #19 (seriously, £16 instead of £50 for 8 terminators? Ok then) and that gives me more, so a couple may make it onto the big bad bots. Gitsplitta wrote: Looking forward to another year with you Graven. Keep up the fine work. Thanks bud. Hope the public servant hell gets better; we're in our own version of that, which will probably lead to industrial action, but at least we're getting paid at the moment. In the end, I kept it pretty simple, just adding the odd tentacle, twisted root and strip of skin here and there. 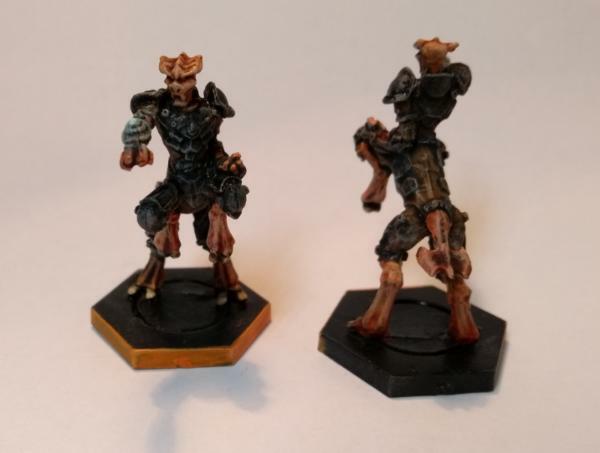 I really should be painting my Rebs for the Dreadball challenge but I'm having a hard time getting my head round them they are started, but there's not much to see, because I'm just blocking atm - most of the alien skin tones are done; now, onto the brown cloth. 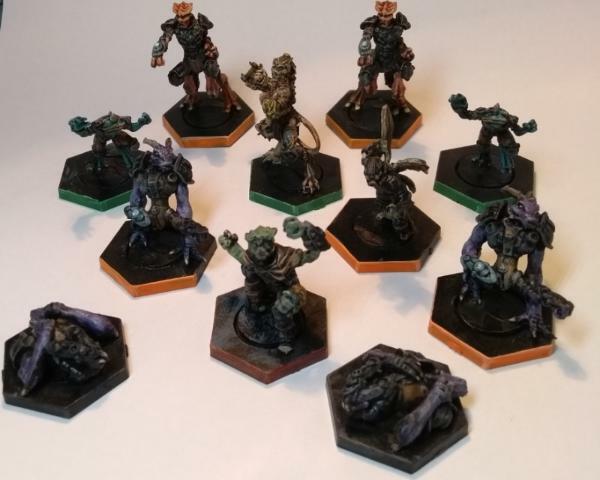 However, also on a Dreadball note, my mates are very keen to get into the game, so I'm hoping for some serious neodurium action in the coming months - makes giving away 4 of my 5 remaining unpainted teams (!) more palatable (well, technically, it's just 4 teams, but I have a full double set of the Rejects). 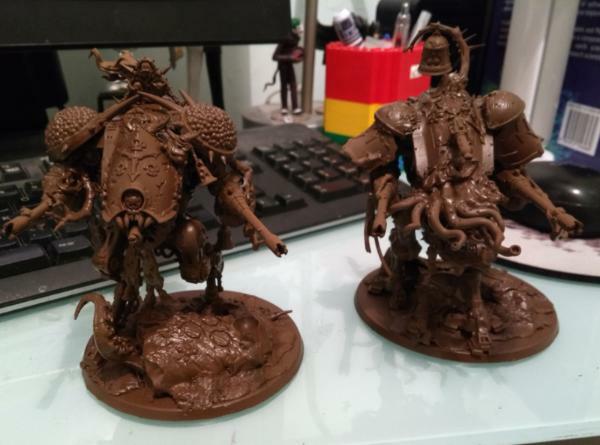 The two big mothers are looking great especially now they are primed. 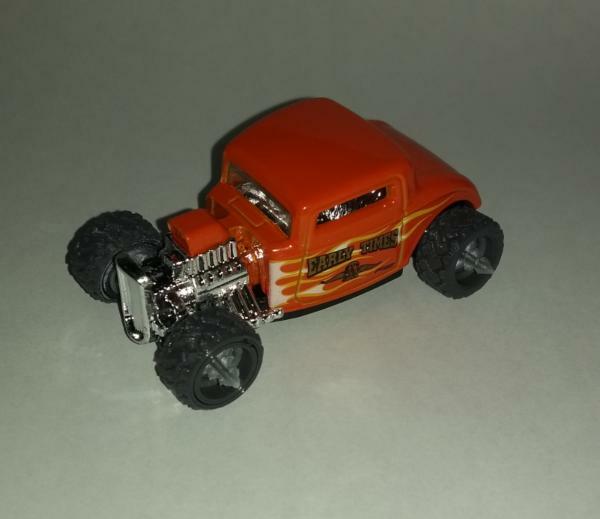 Make sure to hit Gaslands website and sign up for notification emails. Extended time four came out a few weeks ago and now there are extra vehicle types. 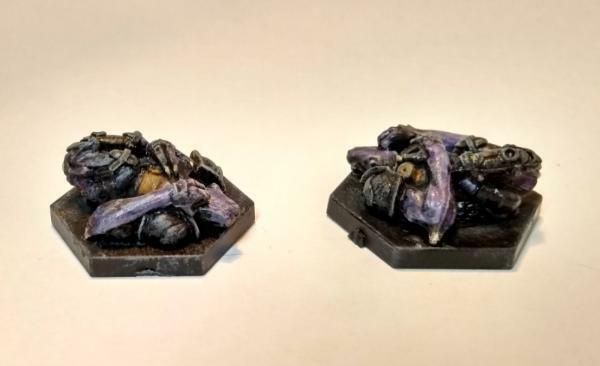 There are flat and gloss versions of Nuln Oil, as I've discovered. Which one do you have? I use them both... the gloss version is great for giving a grimy or oily appearance. Theophony wrote: The two big mothers are looking great especially now they are primed. Briancj wrote: There are flat and gloss versions of Nuln Oil, as I've discovered. Which one do you have? Gitsplitta wrote: I use them both... the gloss version is great for giving a grimy or oily appearance. Hmmmmmmm. Mebbe. I do love my VJ smoke though. 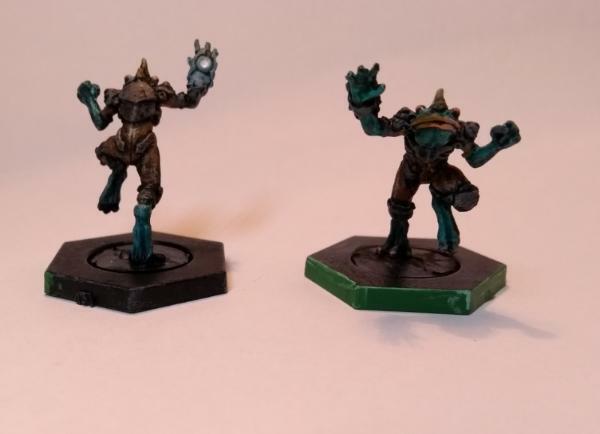 Not much progress on the dreadball team. Just can't feel it, don't no why. So I chopped my tainted cohort a bit. Now they each have an axe and a combi plasma (more GS required, obviously). Traded off my second set for a nos squad of reivers for the kids. I'm such a sucker. 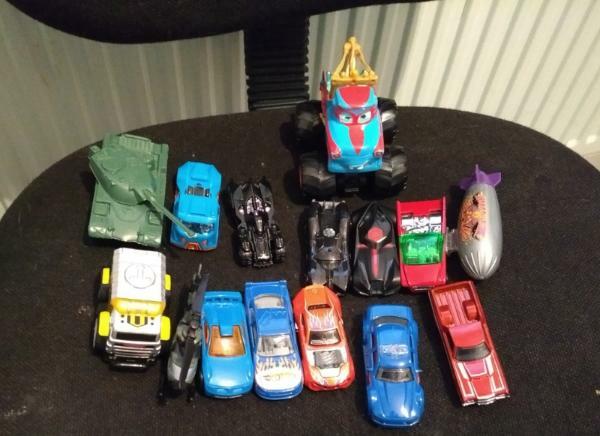 Subject: Re:Graven's Shelf of Shame Jan 12th - trained Cohort and Rat Rod time! If it just says a nuln oil, then that’s the regular, the gloss specifically says Gloss and was just released recently so the older style like coke and coke classic . 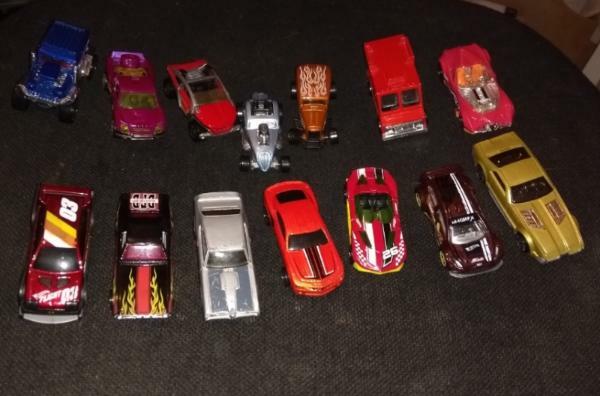 Subject: Graven's Shelf of Shame Jan 12th - trained Cohort and Rat Rod time! Theophony wrote: If it just says a nuln oil, then that’s the regular, the gloss specifically says Gloss and was just released recently so the older style like coke and coke classic . So, a very quiet weekend, not much done. 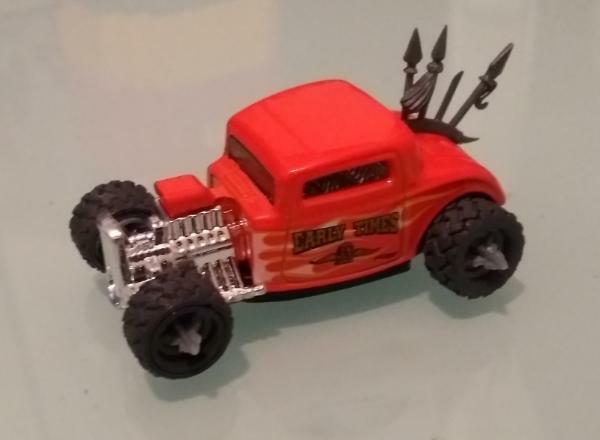 I did, however, come up with a theme and more of a plan for my Gaslands gang. SLIME, as a faction, have the Perk: Pinball - take a free move after you sideswipe. Given that I'm building rat rods with wheel blades, and SLIME are usually Green as a sponsor colour, I present to you... the Pinball Lizards! Obviously not yet painted However, definitely feeling it. Inadvertently kicked the hornets' nest on the GL fb over the rules for side weapons, and now we're waiting on an official ruling. 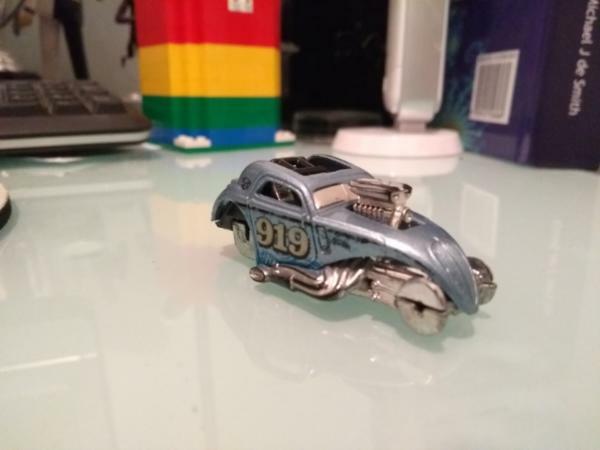 For now, however, this a Car with side rams (1 build slot) and extra armour (other build slot), plus pistols and Molotov Cocktails for the crew (this might change with the new crew weapons rules, though, or I'll add a smoke dispenser with my remaining point). Gone for a more aggressive look with 18mm tires on the back and 14 on the front, rather than 16mm on both like the other one. No spikes yet for this, the chaos racks don't look quite right. However it has the skull on front regardless. Counts as a buggy because it has an internal roll cage, I'm thinking of big front shocks also to make it look... bouncy. Needs a ram though, because plan for it is Buggy w. Exploding Ram (yeah, it's a Kami-KaRzi). 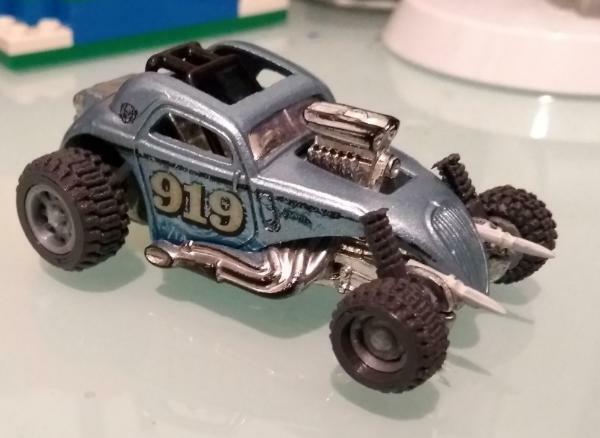 I also need to find another similar Hot Wheels rat rod buggy so I have two (giving me a full 50 can team). I suppose I could just add spikes to the front, maybe? or maybe have big leaf springs and mount a ram on that? I'm going to try to persuade him to do a black rim base, I think it'll just look neater. We've got a few more to brass detail and prime up (2 Inceptors, 4 Hellblaster, 4 Intercessors) and then we can start to think about planning a couple of tactical squads (I have no idea what's what these days, so they'll probably just get a Rocket Launcher and a Plasma Gunner) to build next. BUT I'm going to force the boy to paint, damnit! Good habits and that. I'm getting nowhere with painting my Dreadball stuff, just can't muster the interest which is weird. 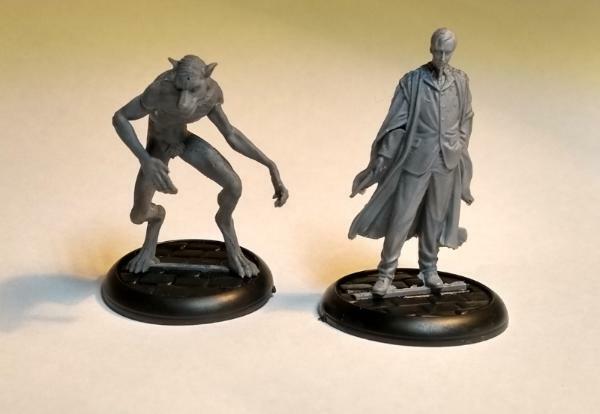 I think it's because I've just got so damn much to paint at present - much like I can't think about building my new Batman stuff. There's no way I'll get them done for Friday, for the contest deadline, but such is life. On a bit of a Dreadball note, however, the next LoER contest is about Sports, and so that has got me thinking. My initial thoughts are a launch tower for Ultimate (a hexagonal column, essentially) or a dice tower that will house the commentators also. 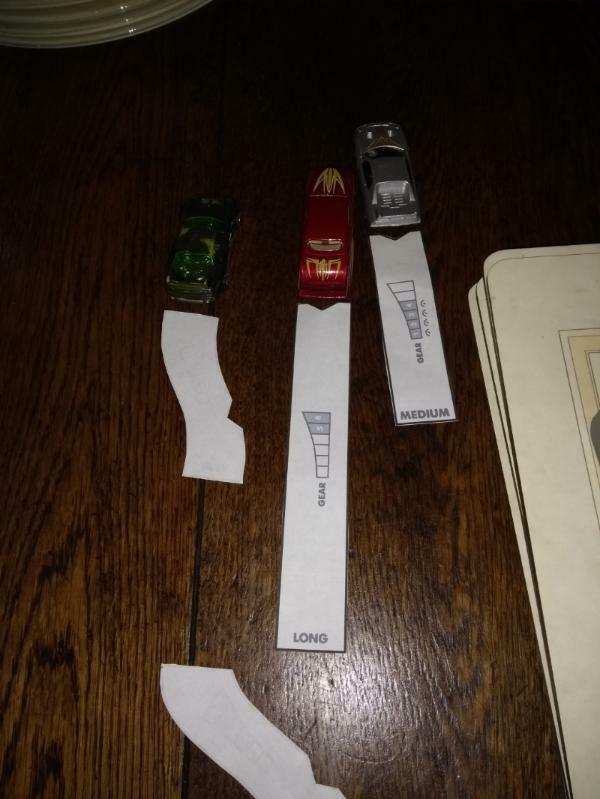 However, the contest requires you incorporate some genuine piece of sporting or board gaming element (non-miniature) into it so I'm a bit stumped. I shall mull it over. Nice to see you plugging away on a variety of projects graven. 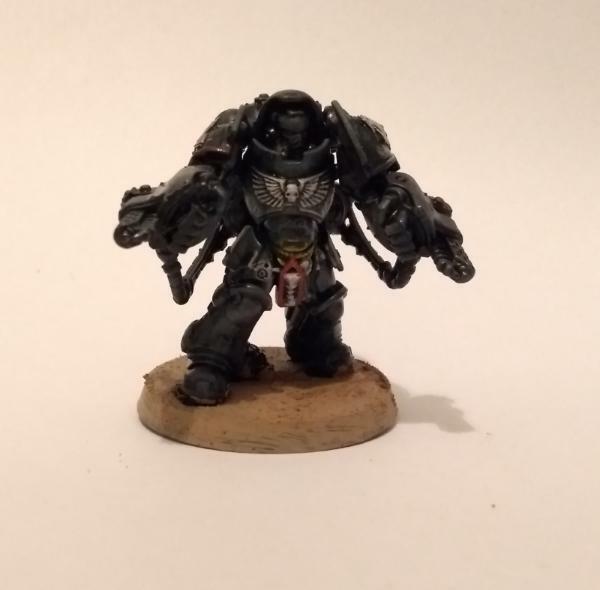 Tell your son he's done a good job on the Ravenguard... but they need a black rimmed base. First it'll give them more of a finished look, second it'll tie in with the color of the marine. Gitsplitta wrote: Nice to see you plugging away on a variety of projects graven. 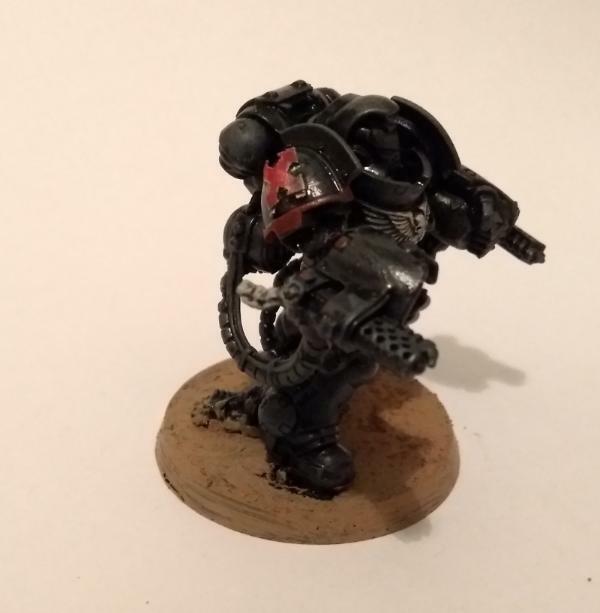 Tell your son he's done a good job on the Ravenguard... but they need a black rimmed base. First it'll give them more of a finished look, second it'll tie in with the color of the marine. 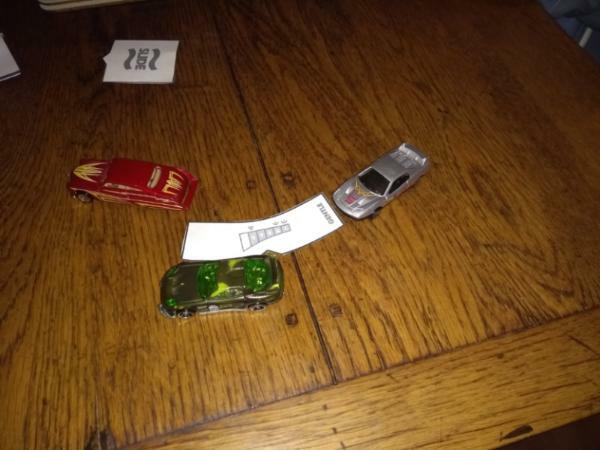 We were clearing out #2's room a bit and found a few more cars. It isn't that I don't LIKE them, it's the COST. The one Citadel bottle is worth maybe 10 bases? Far better to you to mix up a larger bottle yourself, and give THAT to the lad. I’d have to dig out my copy of the game, but can’t The Australian crew take motorcycles? Ramshackle Games makes good bikes that fit the scale, so if your wanting to up your crew size that would be one option. Briancj wrote: It isn't that I don't LIKE them, it's the COST. The one Citadel bottle is worth maybe 10 bases? Far better to you to mix up a larger bottle yourself, and give THAT to the lad. Meh. It's his money No, you're quite right, and easy enough to do. Theophony wrote: I’d have to dig out my copy of the game, but can’t The Australian crew take motorcycles? Ramshackle Games makes good bikes that fit the scale, so if your wanting to up your crew size that would be one option. but it's good for sparking ideas. 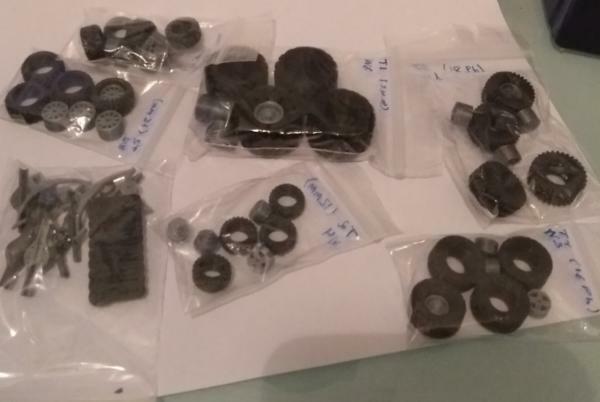 So, more csm spikes, for the ram this time, a couple of small leaf springs behind the rear wheels with phatties on, and some tiny 3D printed springs for the front shocks - I need to make the rods for these, again it'll be just paperclips, but you see where we are for now. Good work on all the things. Dr H wrote: Good work on all the things. 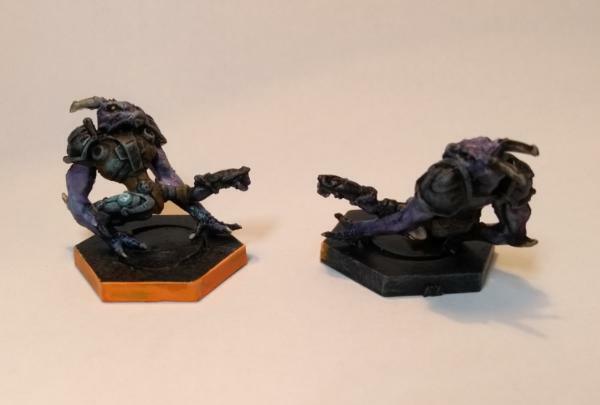 Surprisingly, I finished my Rebs Unincorporated team, the Serenity Browncoats, in time for the current DB contest. 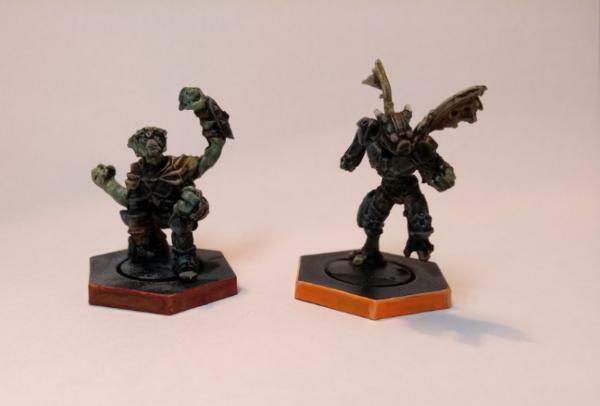 Even more surprisingly, once I turned the corner, I really enjoyed both painting them and the finished look. 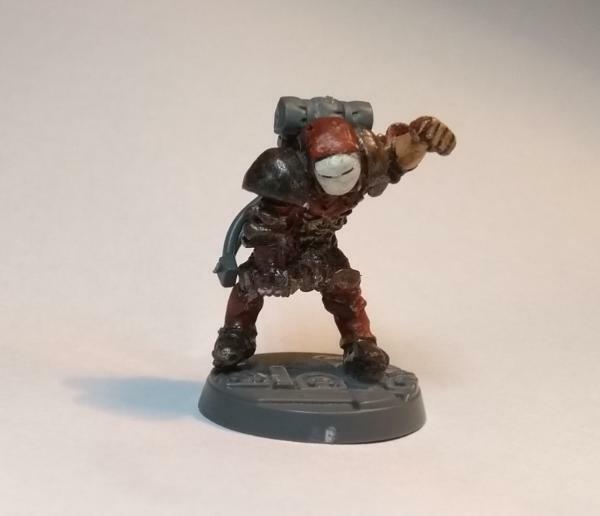 Particularly happy with the OSL from their dreadball gloves. Lovely model, great in game, fast and brutal, really good at taking down walls of guards. 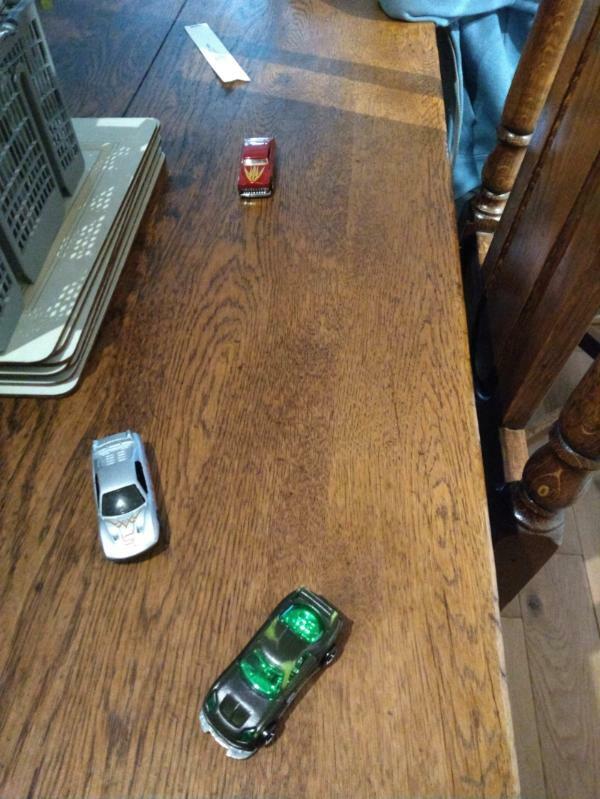 Sooo... what are the cars for again?